I am pleased to write herein that I have come to Delhi from my H.Q. 1/859 Kesh Ghat, Vrindaban, (U.P.) purely on spiritual mission to propagate the cult of devotional service of the Lord. And I am more pleased to mention herewith that Sriman Shri Krishna Sharma, Haribhaktan das, has provided me with a suitable room for my literary activities. I am publishing an English fortnightly magazine of the name "Back-to-Godhead" from this place and the Nawal Prem Shabha of which Krishnaji is the Hon'y Secretary is arranging for my daily lectures on Srimat Bhagwat. Late Pandit Jyoti Prasad Sharma father of Krishnaji was also known to me and during his life time whenever I used to come to Delhi. Late Pandit Jyoti Prasadji would provide me with residential place. His good son is also following the foot prints of his noble father and as secretary of the Nawal Prem Sabha, he is doing good service in propagating Rama Nama all over the city. the public in spiritual values and I have a mission to organise all temples for that spiritual education. Temples are not meant for ordinary householders engaged simply in the matter of animal propensities. 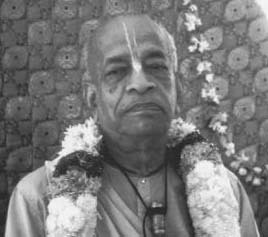 Those who are actually engaged in the service of the Lord Deity, the predominator of the temple; can only be allowed to remain in the temple, otherwise not. Anyway so far I have been well treated both by Shri Krishnaji the Secretary and Sree Prabhatilal along with his son Sitaram -- care taker of the temple. I wish all improvement of this spiritual establishment and I have full cooperation with the authorities concerned for this purpose. At last I must thank Sriman Hari Bhaktanudas Shri Krishnaje Sharma for his kindly providing me with a place for conducting my activities in the service of the Lord and without his help in this way it would have been an impossible task for me to start the paper Back-to-Godhead. I am waiting for the inauguration of the Bhagwat class proposed to be held in the temple daily.